With 2017 marking the 500th anniversary of beginning the Protestant Reformation now is a good time to reflect on that disruptive event in church history. Many view the Reformation as nothing less than a tragedy that rent Christendom asunder, leading to the fragmentation of the church into thousand denominational pieces. That is certainly the view of Rome-friendly commentators. Even among Protestants, the Reformation is often viewed as a decidedly mixed blessing. Alister McGrath charged the Reformation with unleashing Christianity's Dangerous Idea; the right of all believers to read the Bible for themselves and decide on its meaning. Gone was the magisterial authority of the Pope of Rome to declare what Scripture teaches. Now any believer's reading was as good as another's. Cue interpretive anarchy, doctrinal confusion and ecclesiastical division. That's the 'Babel', bit in Vanhoozer's title. The Reformation's insistence on sola Scriptura meant that all controls on how the Bible was to be read had been thrown to the wind. From those days there was no kingly magisterium in Israel; everyone saw in Scripture what was right in his own eyes. 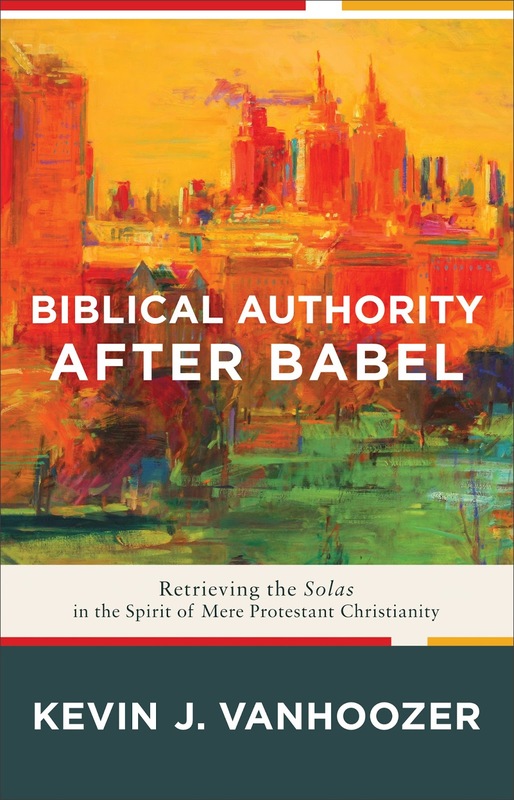 What Vanhoozer attempts to do in this work is to show that sola Scriptura - Scripture Alone was never meant to be taken alone, but understood in the light of its companion Reformation solas. Namely, sola gratia, sola fide, solus Christus and soli Deo gloria. When taken together the solas place the Bible and the individual believer in the context of God's gracious action in Christ by which he draws his people into the church through faith the the gospel message revealed in Holy Scripture. 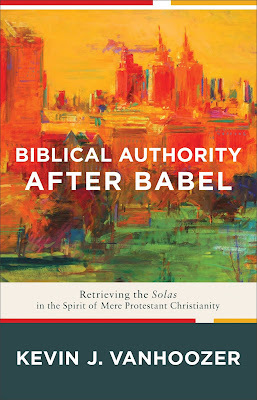 As the subtitle suggests the author is intent on Retrieving the Solas in the Spirit of Mere Protestant Christianity. He points out that "retrieval is not replication but a creative looking back for the sake of a faithful moving forward." (p. 37). Exploring what the Reformers meant by the solas in the context of their controversy with Rome provides the contemporary evangelical world with a valuable resource 'that encourages the church to hold fast to the gospel and to one another.' (p. 33) By 'mere Protestant Christianity' Vanhoozer is not positing a lowest common denominator approach to evangelical belief and churchmanship. Rather, mere Protestant Christianity retrieves the solas as guidelines for faithful biblical interpretation. It also seeks to recover the royal priesthood of all believers, recognising the church as the community that is being led by the Spirit to understand and embody what is in Christ as disclosed in Holy Scripture. In giving careful attention to the solas, Vanhoozer is able to address some of the charges that are regularly leveled against Protestant Christianity besides interpretive individualism and ecclesiological fragmentation, were they not heinous enough theological crimes. One is that Protestantism begat secularism. Roman Catholic writer Charles Taylor alleges as much in his A Secular Age. Protest scholar Alister McGrath more or less says, 'It's a fair cop, gov' in Christianity's Dangerous Idea. Vanhoozer contests the charge that in ridding nature of its sacramental quality Protestantism was responsible for disenchanting the world, paving the way for a secular outlook. The writer responds that an important strand of Roman Catholic teaching postulated a realm of 'pure nature' that could exist autonomously and apart from the grace of God. How disenchanting is that? Another suggested that nature participates in grace and mediates grace, most especially through the sacraments. Yet if grace is pretty much intrinsic to nature, then grace has been disenchanted, the Creator/creature distinction is fatally compromised and the singularity of Jesus Christ as the Word made flesh is undermined. Once more, the secularising trajectories are obvious. In retrieving sola gratia, Vanhoozer develops an ontology of Triune grace that avoids fusing grace and nature. God as Father, Son and Holy Spirit was fully actualised in the free and loving communion of his own three-personed being. He had no need to create the universe in order to complete himself in any way. Creation was an act of free communication on the part of the Triune God. He did not owe the world its existence. Bringing the universe into being was an act of sheer grace on God's part, defined as, "the gift of God's beneficent presence and activity - that is, the communication of God's own light, life and love to those who have no right to them nor a claim on God...Put simply, grace is the Triune God - God sharing his Fatherly love for creation in the Son and through the Spirit". (p. 53). Nature has no autonomous existence apart from grace. Grace cannot be collapsed into nature. It is not a 'thing', but God's free and loving attitude towards that which is not God. Just how amazing is the grace of God is brought into sharper relief when we reflect on his grace towards fallen humanity. What sinners deserve from God is his wrath and judgement. Grace as the word is most often used in the New Testament is God's undeserved giving of himself to rebel sinners. "It is indeed wonderful to participate in being (creative grace), but it is something even more marvelous when fallen creatures participate in Christ (redemptive grace)." (p. 54). The goal of God's gracious purpose is to "unite all things in Christ" (Ephesians 1:10). To that end the Trinity acted to redeem lost human beings and restore them to communion with the Father, the Son and the Holy Spirit. Scripture reveals the economy of God's saving work in the unfolding covenant of grace. While the external actions of the Trinity are undivided, each person of the Trinity had a special role to play in the great drama of redemption. The Father sent the Son, the Son is sent into the world as man to redeem us by his blood, the Holy Spirit is given to communicate the salvation accomplished by the Son to God's new humanity. Sola Scriptura must be seen in the context of the drama of redemption. It is not to be understood as the right of every Christian to say what they like about the Bible. Rather, it is that God uses his written Word to communicate salvation to his people, enlightening their minds by his Spirit so that they are made wise for salvation through faith in Jesus Christ. Grace does not simply perfect the believer's natural ability to read and understand the message of the Bible. It restores the sin-darkened mind by giving light and reorients the sin-twisted heart towards Christ. This is not so much the 'right of private interpretation', as the grace of right interpretation that enables the believing reader to perceive the light of the Living Word shining through the written Word. The Spirit illumines the faithful, opening eyes and ears to see and hear the light of the world, the Word of God dazzling in the canonical fabric of the text: God's unmerited favor towards us shining in the face of the biblical Jesus. (p. 69). If the formal principle of Reformation theology was sola Scriptura, the material principle was the gospel of salvation through faith alone. And it is to sola fide that Vanhoozer next turns his attention. But you'll have to wait until part 2 of this review series for that, and maybe a bit more besides.